So I've stepped from behind the keyboard and I am front and center stage. A national stage no less. 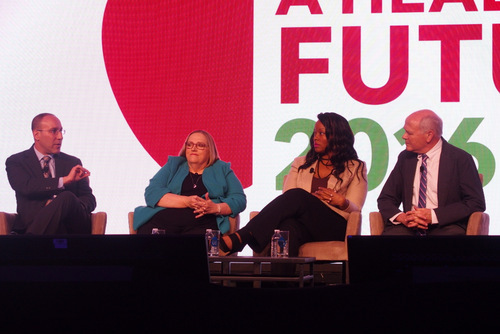 I was invited to the Partnership for a Healthier America summit to speak on the opening panel about my personal experience with obesity. I spoke on the same stage as the Surgeon General and Michelle Obama. Just like the Jefferson's, I'm moving on up. The experience was so incredibly profound that I'm actually still trying to process it almost a full week later. I told my story and in return many more people opened their hearts and shared their own. It sounds like a line, but I left with my vessel overflowing and I'm ready for it to spill over and water the seeds that we are beginning to sow. To Patty Nece, Dr.Scott Kahan, Ted Kyle, and every single person there at that summit, I thank you from the bottom of my heart. This article is great, so is amazing. I really enjoyed reading it. I liked it very much. Thank You very much for sharing this article.